Port Moresby, Papua New Guinea—Leaders from 21 Asia-Pacific nations failed Sunday to bridge gaping divisions at a summit overshadowed by a war of words between the US and China as they vie for influence in the region. “The leaders agreed that instead of a traditional leaders’ declaration, they would leave it to the hands of PNG as the chair to issue a chair statement on behalf of all the members,” said Zhang Xiaolong, a spokesman from the Chinese foreign ministry. Pence warned smaller countries not to be seduced by China’s massive Belt-and-Road infrastructure program, in which Beijing offers money to poorer countries for construction and development projects. In a speech to business leaders just minutes before Pence, Xi insisted the initiative was not a “trap” and there was no “hidden agenda” – amid criticism that it amounts to “checkbook diplomacy” in the region. 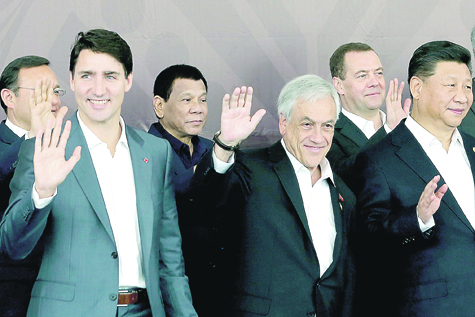 The barbs on a gleaming white cruise ship moored in Port Moresby set the scene for a potentially fiery meeting between Xi and US President Donald Trump at the G20 summit in Argentina at the end of this month. But Xi and Pence, who both wore shiny, red shirts provided by the Pacific island hosts, did hold talks on Saturday night at the leaders’ gala dinner. He told him that the US is interested in a better relationship with China “but there has to be change” in Beijing’s trade policies. “It’s a very forced situation, one country is trying to force all the other countries to change tariffs agreed over years,” O’Brien said. Trump—and Russian President Vladimir Putin—both decided to skip the gathering, leaving the spotlight on Xi who arrived two days early to open a Chinese-funded school and road in Papua New Guinea’s dirt-poor capital Port Moresby. Xi has been the star of the show, front and center at official photos whereas Pence has kept a lower profile, only deciding at the last minute to stay overnight in Port Moresby—shelving original plans to fly in and out from Cairns in Australia. The project aims to raise the percentage of the PNG population with access to electricity from 13 percent to 70 percent. The Chinese delegates “tried to barge in” to Rimbink Pato’s Port Moresby office Saturday, in an eleventh-hour bid to influence a summit draft communique, but were denied entry, three sources with knowledge of the situation said. “Police were posted outside the minister’s office after they tried to barge in,” one source privy to summit negotiations said. The minister himself sought to downplay the incident. “There wasn’t an issue,” he said. At the Pacific Islands Forum in September, Nauru’s president demanded China apologize after its delegation walked out of a meeting when the host refused to let an envoy speak until island leaders had finished.